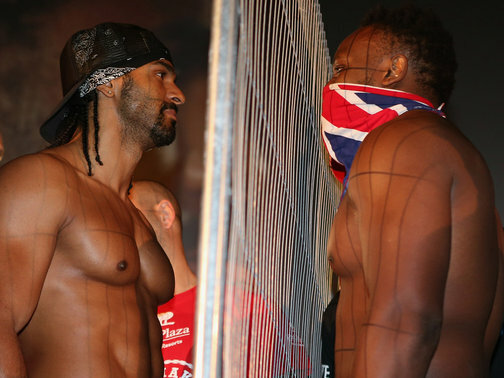 Dereck Chisora against David Haye is finally here. Everyone knows how the fight has come about and everyone knows about the controversy with the BBBoC. That’s all out the way now. The build up has gone smoothly. So has the weigh-in. (Maybe that fence can take some credit for that). Now it’s time to fight, time to finish this rivalry for good. And to be honest, I’m struggling to pick a winner right now. Haye has won world titles, been in there with the better Klitschko, is faster and is definitely the better athlete. Chisora is has lost his last 3 but is more durable, has the better chin and is a natural heavyweight. So how does this fight play out? The fact the fight is only scheduled for 10 rounds might have a huge impact. Chisora is a slow starter and if Haye comes out the blocks quickly, he could catch Del-Boy and that would be all she wrote. Chisora does have a great chin but he hasn’t fought anyone who has that type of explosive power that Haye possess. Alternatively, Haye could just use his reach and height advantage to box his way to an unanimous decision. So I do think Haye has the better options going into this fight. I don’t think Chisora can out-box or blast him out of there. For Chisora to really stand a chance, he has to be bang on from the jump. He has to use his head movement as he walks Haye down and once he’s in range, jump on him and unload punches to the body, really pressure Haye. But he has to make sure he has good head movement because if he doesn’t, Haye will catch Chisora as he walks in. If the fight was 12 rounds, I’d probably back Chisora on points because he gets stronger as a fight wears on but seeing as it’s only the 10 rounds, I think it plays into Haye’s hands. At this point, I’ve change my mind about 100 times and I’ll probably change it 100 more before the first bell rings. But I’ll stick my neck out here and go for a David Haye win, via points. 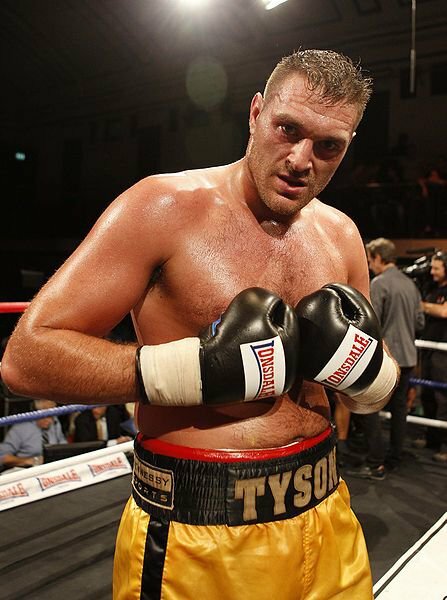 Tyson Fury continued his push towards a world heavyweight title after he stopped Vinny Maddalone in the 5th round. Fury was never tested as he found his jab from the opening round, snapping Maddalone’s head back repeatedly. Tyson almost finished the fight in the fourth as he landed big right hands to the body, which left Maddalone shaken up. There was no rest for Maddalone in the fifth as Fury kept up the pace and after another fierce barrage, the referee thankfully stepped in to end the contest. 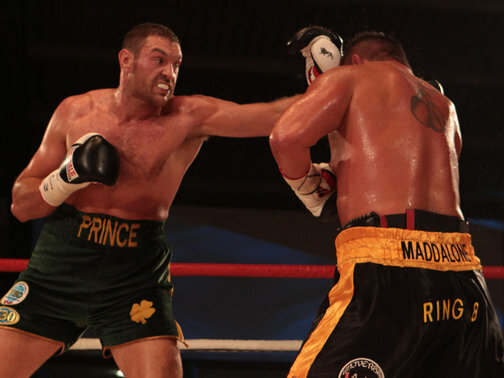 Following the figth, Fury called out pretty much everyone in the heavyweight division except David Price. If Fury isn’t going to fight Price, then I’d like to see him try and get a fight with either Tomasz Adamek or Alexander Povetkin. I think Fury would beat either of these guys and it would really put his name out there and get wider exposure for himself. However I won’t be surprised if he takes a couple more contests like this over in America to try and build up his name over there. British hopes will rest on the shoulders of Michael Sprott when he takes part in Prizefighters International Heavyweight show. Sprott, who is the current domestic heavyweight champion of Prizefighter, has signed up for the May 7 tournament to replace Prizefighter’s inaugural champion, Martin Rogan. The tournament will follow the same format, 8 boxers who square off until the final two meet for the £32,000 prize money. 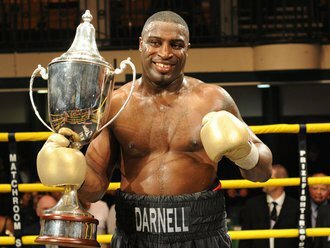 Sprott, who defeated Matt Skelton to win the last heavyweight Prizefighter tournament hasn’t been seen in a UK ring since. Instead he has been over in Germany sparring with none other than Vitali Klitschko for three weeks, before claiming a unanimous decision over Turkish boxer Serdar Uysal in March. Sprotts career hasn’t quite taken off as he would have liked after winning Prizefighter in the way it did for Audley Harrison and Rogan; who both earned shots for notable titles. However Sprott believes Prizefighter gives him the perfect chance to put himself back on the map. He told Sky Sports: “I’m definitely ready to fly the flag for Britain, it’s going to be great mixing it with all the other countries, it adds a different twist to the night and I want to come out on top. This is definitely Sprotts last chance to make an impact, as at the age of 36 there aren’t going to be too many chances after this for him. Sprott will have his work cut out for him but I can see no reason why he can’t go and win the thing and maybe get that title shot he has desperately been looking for. I mean if Fraudley can get a title chance, then surely no-one would begrudge Sprott his chance. American Kevin “Kingpin” Johnson, whose only loss came on points against Vitali Klitschko, Irish-based Cuban Mike ‘The Rebel’ Perez, a knock-out artist, and German Konstantin Airich, a former Danny Williams opponent, are the other confirmed fighters.